Warning: this article actually has nothing to do with how to prepare for Brexit. So if you’re a hopeful British resident, you’re annoyed. My apologies. My objective is to show how you can write a Yoast-friendly article that still fails to meet a reader’s expectations. Hopefully, you won’t get fooled again. Before you get the idea that Yoast is a bad tool, it’s not. I’m a big Yoast fan. Good content creators use it faithfully. Unfortunately, so do not-so-good ones. 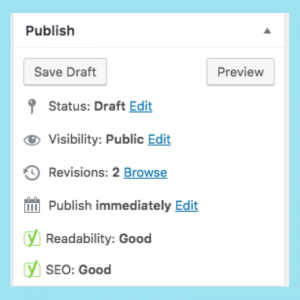 You can write a “green light” article that checks all the boxes on the SEO app’s list. That doesn’t mean its content is relevant to the reader – or to your brand messaging. Yoast’s developers give a busy blogger guidance. The tool is straightforward. If you’re a harried business owner who’s trying to get a post out, your content is likely relevant. An auto repair shop isn’t going to write about making muffins. That ease-of-use is the app’s genius. Web designers and developers use it. Writers demand it. After all, search-friendly content is a must. Why not make it easier to achieve? Are you using Yoast as a crutch or for guidance? The problem is that the free content writers rely on it overmuch. When you get an offer to write free content for your blog, those folks are check-listing hard. An article that should relate to your yoga studio’s differentiators may hit all the check-list marks but not elevate your services. This is all-too-common in the freebie samples that I’ve reviewed for friends and peers. A good content writer aligns with your marketing message, includes your target key search word(s), and elevates your knowledge, products or services. External (outbound) links will reference appropriate materials that strengthen credibility. Internal links will connect to related services or other posts within your website. Photos or graphic images will have alt-tags and add visual support to your article. So maybe you didn’t learn how to prepare for Brexit. But I hope that perhaps you learned a little more about content and search. Absolutely, write search-friendly content. Go for the green light score! Just be sure you’re using Yoast not only to rank in search-engines, but also to advance your expertise, your differentiators.